Pizza Hut has a lot to brag about, but it's way too humble to do so. So, the pizza chain is having some surprising characters do the bragging for them. That's the premise of Droga5's amusingly offbeat first work for the brand, which carries the tagline "No one out pizzas the Hut" and will feature all kinds of unusual "bragspeople" talking glowingly about the chain's food—beginning with the Grilled Cheese Stuffed Crust Pizza, introduced earlier this week. The first two bragspeople are a homesick alien who's found a lot to like about Earth (in particular, Pizza Hut food) and a man who's suffered a near-death experience and can now see the wonders of the world (in particular, Pizza Hut food) through fresh eyes. Scott Bell, group creative director at Droga5, told Adweek in an interview Thursday that the characters are meant to help snap TV watchers out of their typical commercial stupor. "We wanted to pick memorable characters that, as soon as the spot comes on, you're like, 'Wait, what's this? Why is this person in a Pizza Hut kitchen? What's going on?' So you're more likely to pay attention to what they have to say," he said. The Pizza Hut employees in the spots, meanwhile, seem a bit uncomfortable with the high praise coming their way, which allows the brand to pretend it's not patting itself on the back quite as directly. "They have a lot of things to brag about. They practically invented pizza as we know it," Bell said of the chain, which was founded in Kansas in 1958. "They were the first to allow you to order pizza online, the first to deliver pizza to the White House, the first to deliver pizza to the space station. There's a lot of love for Pizza Hut in the world. But they've never bragged about these things, because they really are a humble company. They don't want to come off as arrogant in any way. So, we wanted to be able to brag on their behalf." The alien spot has clear echoes of ET, though Bell said that's just incidental. "Pizza is something everyone loves but really takes for granted," he said. "Our thinking was, 'What if you looked at it through the giant black eyes of someone who wasn't from Earth?' So you get that perspective on how amazing pizza really is, and how good we have it that we have Pizza Hut pizza." The tagline, "No one out pizzas the Hut," Bell added, is "really about claiming leadership. No one tries harder than Pizza Hut, no one innovates more than Pizza Hut. It really is America's favorite pizza, and it's all about proudly claiming that role as the leader in pizza." 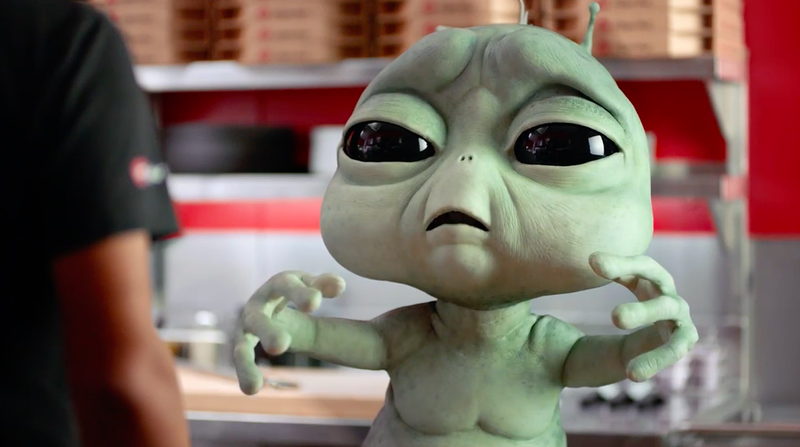 "We were drawn to the power and simplicity of the campaign right away, and we were immediately pleased and excited about what we saw in the first execution," David Timm, CMO of Pizza Hut, told Adweek. Radio ads are also being released with a similar theme, and more TV spots are on the way, including one with a conspiracy theorist character. The campaign's characters may also show up outside advertising, Bell said, including a partnership with ESPN's College Gameday. Bell said it's a "campaign we see going for a long time, and having a lot of fun with," and added that humor was the natural way to go. "Pizza's fun," he said. "People love pizza. I've got kids, and we order pizza every Friday night, and when the delivery man shows up, it's like the house explodes with joy. This just plays into that. It's a fun category, and if we're not having fun with it, then we're not doing our jobs right."